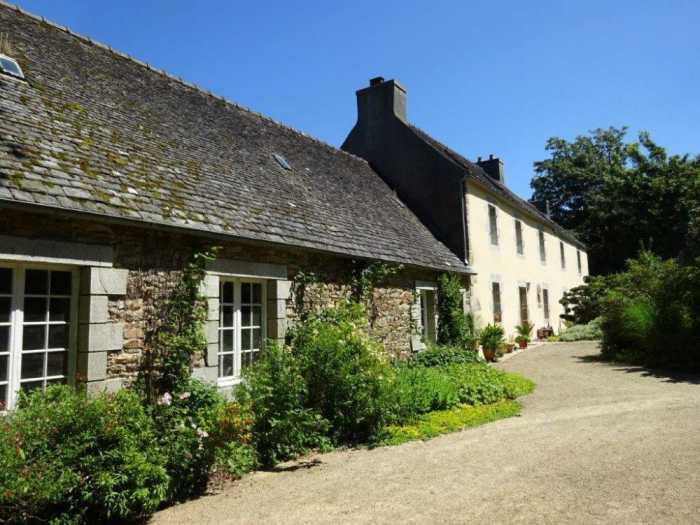 Properties for sale in Brittany, France - AHIB-3-mon1872 St Thegonnec 29410 Handsome 4 bedroomed house with over 5 acres and outbuildings! AHIB-3-mon1872 St Thegonnec 29410 Handsome 4 bedroomed house with over 5 acres and outbuildings! Located at the end of the hamlet with a pleasant outlook, you will find this charming property. The house offers 193 m² of living space with entrance onto the living room with fireplace and wood stove, kitchen and a large pantry on the ground floor. On the first floor, the landing serves 3 large bedrooms, a shower room with WC. Above, a further bedroom, bathroom with toilet and attic. Adjoining a large outbuilding consisting of on one side storage space with boiler-laundry room and on the other side, a workshop. wooden shed, greenhouse, 2 small stone houses at the back with greenhouse and storage .. Garage. Magnificent walled grounds of 1.1 hectare approximately, and embankment including the very nicely planted garden, the kitchen garden and the pasture. A lovely bright house, well exposed south. The property is full of potential. No properties on your shortlist yet! AHIB-3-mon1934 St Thegonnec 29410 Pretty 3 bedroomed house with 1755m2 garden and 1.3 hectare coppice with stream! AHIB-3-mon1932 Plouezoch Gorgeous 3 bedroomed property with 2442m2 garden - mains drainage! AHIB-3-M2241-2914994 Huelgoat 29690 Superb contemporary 4 bedroomed property with 1.5 hectares of land, garage and fantastic views! AHIB-3-M2240-2914993 Nr Scrignac 29640 Lovely stone house with a private garden of 1,646m² in a great environment! AHIB-3-M2230-291499 Nr Plounévézel 29270 Very cute rural cottage, the perfect holiday home, sold furnished! AHIB-3-M2229-2914988 Huelgoat 29690 Pretty longere on the outskirts of Huelgoat with 1 hectare of land, ideal for horses! AHIB-3-M2215-2914982 Hamlet nr Huelgoat 29690 Lovely countryside property, nice house with 1 hectare of beautiful garden, plus a shed and a hangar! AHIB-3-mon1923 Nr Plouigneau Lovely old character farmhouse and several outbuildings in pleasant setting with garden and woodland! AHIB-3-M2213-2914980 Nr Plonévez-du-Faou 29530 2 bedroom village house with courtyard, perfect for the holidays! AHIB-3-M2217-2914981 Nr Carhaix-Plouguer 29270 A renovated 2 bedroom house in a lovely little village, perfect for the holidays!